Lots of places to eat, dine and snack at Mont St-Michel, some with panoramic views, others with money-saving menus and lower prices. 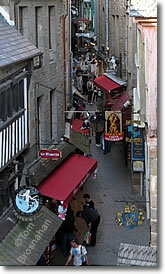 Mont St-Michel's restaurants are mostly located on or just off the Grande Rue, but here's a tip: the few that are not so obvious—that are on back streets, or a climb farther up the mountain—may have lower prices and a more relaxed atmosphere. Specialties include the famous omlettes of La Mère Poulard, and agneau de Pré Salé, lamb and mutton from the sheep that famously graze on the grasses of the salt marshes around Mont St-Michel, browse which gives their meat a special tang and savor. Most visitors to Mont St-Michel are looking for a spot to sip or dine with a panoramic view of the Bay of Mont St-Michel, the tidal flats, salt marshes, and the mainland. There are plenty of restaurants with fine views, and most will be very busy at lunchtime, but less crowded for breakfast and dinner. Hôtel Saint-Pierre and La Vieille Auberge are two hotels with restaurants of long standing, right on the Grande Rue and worth a look. Most menus tend to the familiar tourist favorites—standard traditional items of universal appeal: omelettes, entrecôte (steak), poulet rôti (roast chicken), pasta, pizza, etc. Just about every restaurant has at least one low-priced menu or formule (set-price meal) around 15 euros, then others at 22.50 euros and up. or near the Grande Rue. Some house wines can be had for about 15 euros per bottle, and up. If you stay overnight on the island, you'll have a choice of places for breakfast, but every restaurant and eatery opens for lunch. Some restaurants close from 17:00 to 19:00 (5 to 7 pm) in the evening to give the staff a break, then re-open for dinner, which is never as crowded as lunch. Most restaurants stop taking guests' orders at 21:30 (9:30 pm), and close about an hour or two later. Don't forget that there are many other restaurants, often with lower prices, at Les Portes de Mont St-Michel, 1.5 km (1 mile) at the southern end of the causeway; in the village of Beauvoir, 5 km (3 miles) south of the island, and in the town of Pontorson, 10 km (6 miles) south of the island. On my first visit to Mont St-Michel in 1966, the restaurants served tiny shrimp (crevettes) from the bay, but I no longer see them on restaurant menus. 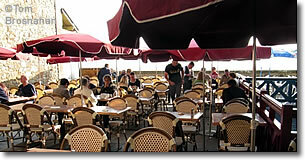 Above, a restaurant terrace in Mont St-Michel. 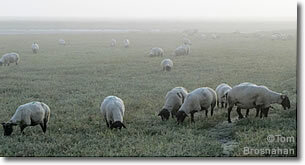 Below, agneaux de Pré Salé dining on the salt marsh grass that gives its special savor.